Since we had some special visitors coming yesterday, I got up early and jumped on the ipad and opened the pinterest app. I wanted to make something nice and try out a new recipe. My hubby’s brother and his lovely wife with their two little kidlets were coming for lunch and afternoon tea. We always enjoy seeing them all and love having a chat. The kids toys come out and get spread all over the lounge room floor. They spend the time playing, chasing each other and going from room to room checking everything out. And then when it comes time for them to leave, we are already planning our next get together. Every time the kids have a ball playing with each other. 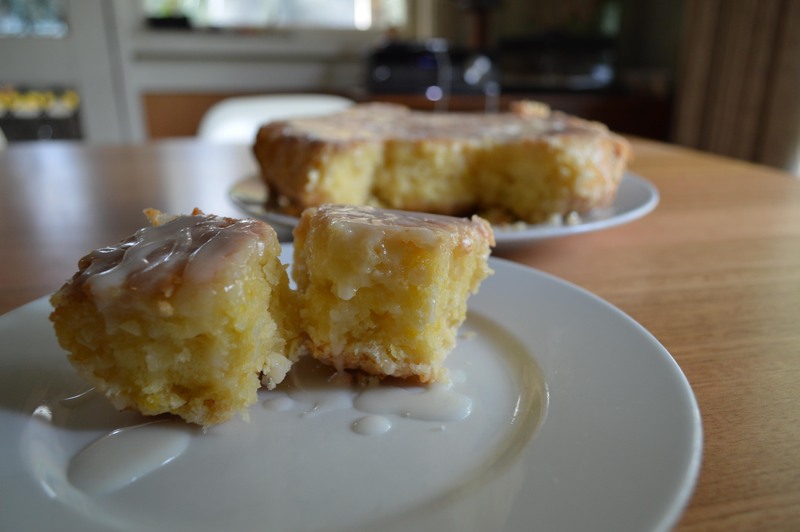 For our lovely afternoon tea, I chose to make a Lemon Pound Cake. I had some lemons that I needed to use and I haven’t made a lemon cake for awhile. Using an electric mixer, cream together butter and sugar. Add eggs one at a time, beating until well blended after each one. Add flour, baking powder and salt and then mix while slowly adding the milk until combined. Then add lemon juice and lemon zest, mix in gently. Bake cake until tester inserted into centre comes out clean, about 45 - 55 minutes. Depending on your ovens cooking time. Cool cake in pan for 15 minutes. Once the cake had cooled down, I made up some lemon icing using icing sugar, soft butter, juice from 1 lemon and some milk. I cut the cake in half and spread some icing in the middle. I put the cake top back on and then used up the rest of the lemon icing for the top. I decided the cake needed something else to put on top of the icing so I looked in the cupboard and found some shredded coconut. I sprinkled some on top, perfect! The cake was ready for afternoon tea. After lunch was over and some chatting was done, the kettle was put on. The cake was sliced and served up, time to dig in. Well, the cake was a hit and everyone loved it. It was lemony and moist. The amount of lemon in it was just right. It was a refreshing moist lemony pound cake! It wasn’t heavy. There was some room for a second slice but it was nice to just enjoy the one. I will definitely make this again. There was alot of mmm’s, yuumm’s and so nice. I have pinned it on my baked goods board in pinterest. YUM! 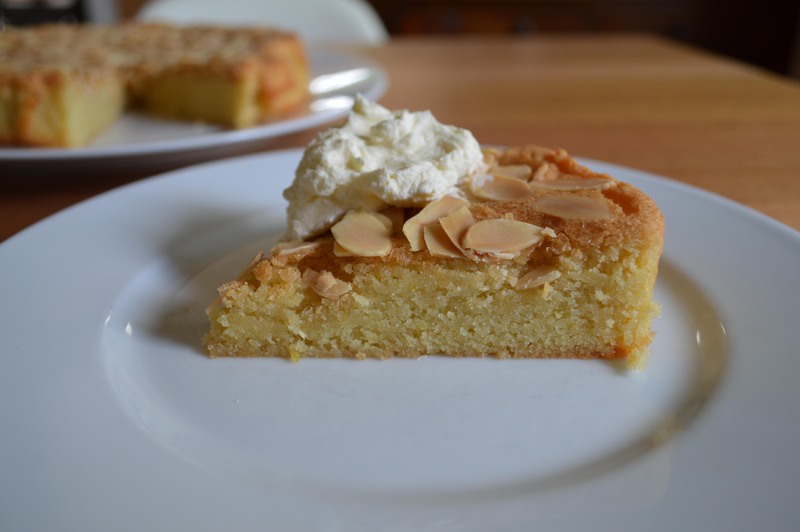 By request from hubby and kids, I made the almond cake again. It’s a lovely cake and you just want to keep eating it. I also made a marble cake. I haven’t made one of these cakes in ages. It was very nice. These are the cakes that I made for joining in with #sundaybakingsunday on instagram. The recipes will be posted up on my blog tomorrow. You too can join in with the lovely Annette @igiveyoutheverbs with her #sundaybakingsunday. Just tag your photos with #sundaybakingsunday. We would love to see what everyone is baking. Did you bake on the weekend? Did you try any new recipes? I had been wanting to make these two pull apart baked goodies since last weekend. But since we had left over homemade pizza, my sunday baking sunday wasn’t accomplished. So with no left overs in sight, I woke up yesterday with excitement that I could get into my kitchen and make these two yummy treats. This is best eaten on the day it is baked. Serve it warm. Add the butter and rub into the dry ingredients. Crack eggs into a measuring jug then add enough buttermilk to fill up to 1 cup. Lightly mix eggs and buttermilk with a fork. Mix only until flour is incorporated, handle as little as possible to make light biscuits. The dough will be sticky and in order to roll into balls you might need to add a tiny bit more of flour. The dough should still be slightly sticky. Separate pieces of dough and roll into 17 balls. Rolling mixture: Combine the rolling mixture ingredients and roll the balls of dough in this mixture. Place the covered balls in a 9" round pan lined with baking paper. Bake at 170ºC fan forced/190°C for 20 to 25 minutes until golden brown. Once out of the oven, immediately turn over onto a plate. Cool slightly and drizzle with glaze. This was a delicious cake. After its finished baking, you need to turn it over so the cakes crunchy topping will be on the bottom. The texture is so nice with the softness and crunchiness. I found this cake to be refreshing almost as it has the lemon in it. It had just the right amount of lemon flavour. The cake was lovely for an afternoon treat, perfect! Now I always like to make something with a bit of chocolate in it. I thought I would give this Chocolate pull apart a try. This is best eaten on the day it is baked. Serve warm. Heat the milk up in the microwave until just warm. You don't want it to hot. Add in the yeast and ¼ tsp sugar, gently whisk until the yeast is dissolved. Let it sit for 5 mins. Then whisk in the melted butter and egg yolk. In the bowl of a stand mixer, add the flour, ¼ cup sugar, salt and stir. Make a well in the flour and add the wet ingredients. With the dough hook set to low, combine the ingredients, occasionally scraping down the sides of the bowl, until the mixture becomes sticky. Turn the speed to medium and kneed for 6 minutes until the dough forms a ball around the dough hook. If this does not happen by 5 minutes, add 1 - 2 tbsp of flour until it does. Remove the dough from the bowl, and form it into a ball. Rub the inside of a large bowl with butter/oil (not olive oil) and then roll the dough in the bowl to coat. Cover the bowl with plastic wrap and place in a warm area for about an 1 hour or until the dough has doubled in size. Once the dough has doubled in size, roll it into a large rectangle. Spread the 90gms of butter on the dough leaving a half inch border on all four sides. Sprinkle the chocolate onto the dough, making sure to leave the half inch border. With the dough in front of you, the longest side placed horizontally, begin by rolling the dough tightly from the bottom to the top. Once you have reached the top, pinch the ends tight, and then with a sharp knife, cut the rolled dough into 1 inch rounds. Line a loaf pan with some baking paper and then place the dough rounds into the pan in a messy fashion. The messier they are, the prettier it will look once baked. Cover with a cloth and let double in size for 40 minutes. Icing: With a hand mixer, beat ¼ cup of cream cheese and ½ cup of icing sugar until combined. Slowly drizzle in ½ - 1 cup of heavy cream, until the icing has reached a pourable consistency. 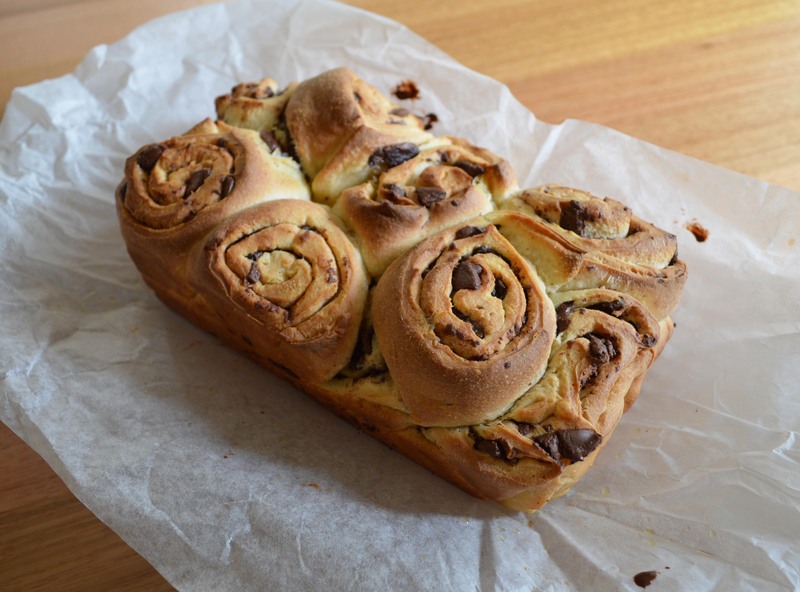 Remove the chocolate pull apart from the loaf pan and drizzle with the icing. Serve warm. This was lovely, chocolatey and gooey. The icing on it was amazing. I could have just eaten the icing out of the bowl. The kids enjoyed getting stuck into it. It was a lick your fingers baked treat. Although it was yummy, I felt it was quite heavy and not very light in texture. It was very filling. I only ate one piece and unfortunately couldn’t have another piece of the Lemon pull apart. This pull apart would be suited for a dessert aswell. I found it was a bit too much for an afternoon tea. Overall, both were very nice. They are both best eaten on the day. The kids enjoyed eating both of them and licking fingers included! I love baking for the kids and love knowing that they enjoy eating my yummy baked treats! So as I promised here are the recipes for these two cakes that I baked for Sunday baking sunday. The first cake recipe came from a gorgeous handmade magazine called Hundreds and Thousands. The two girls that put together this great mag are Mezz from mezzmakesstuff and Taz from butterandbuntings. The pages are full of interesting things to read such as recipes, craft ideas and places they visit. They also have a blog for the mag and you can find them at hundredsandthousandsmag.blogspot.com.au. They have sold out of this issue but are currently putting together issue 2, Yay! Now the second cake I adapted from a recipe that was over at the lovely Annette from igiveyoutheverbs. Her recipe was a Date, Carrot and Honey Loaf. I didn’t have dates or honey what I did have was apple, coconut and carrots. But I thought adding carrots to apple and coconut didn’t sound like a good combination. So I replaced the dates with apple and replaced carrot with coconut. I didn’t have enough honey either so I just used brown sugar. I followed the recipe exactly the same just some of the ingredients were different. It turned out pretty good. The kids weren’t to keen on it though they much preferred the Hundreds and Thousands Cake. Sieve the baking soda and flour into a large bowl or mixer. Add all the other ingredients then the melted butter/oil. Mix well until combined. Bake for 15-20 mins or until a skewer comes out clean. Sprinkle with hundreds and thousands. Place chopped apples, brown sugar and water in a large saucepan. Stir over a medium heat until the apples have softened. Add the chopped butter and stir until melted. Take off the heat and add vanilla essence. Add the sifted flour and coconut and gently mix until combined. Pour the mixture into the loaf pan and spread out until even. Sprinkle over the top with raw sugar. Bake for 30-40mins or until the skewer comes out clean. This cake was a success and the kids really enjoyed eating it. 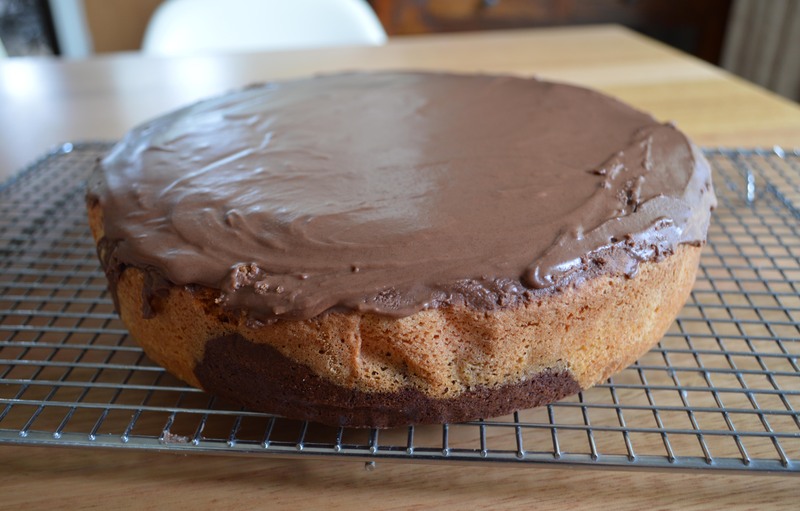 It was a simple and easy cake to make and it turned out soft and moist. The kids have requested that I make this again, please muuummm!! Now this cake was pretty good. The apples were nice and soft. The texture was alright but next time I would like to make the recipe again and maybe change it abit. I would also like to try making the recipe that I adapted this from and see if there is any texture difference between the two. This is what was left of the Hundreds and Thousands Cake, just enough for the kids to take to school today for their lunch boxes. Yum Yum, make again please mum!! Happy baking! Every Sunday morning I spend time in the kitchen baking for our afternoon tea. The kids (Master 8, Master 10 and Miss 6) have swimming on a Sunday around Midday. We have a late breakfast so the kids don’t eat a full lunch before swimming. Once we get back we have an early afternoon tea. We have done it this way for awhile now and it seems to be working. Plus the bonus thing is, I get to try out recipes that I find on Pinterest. I love Pinterest!! 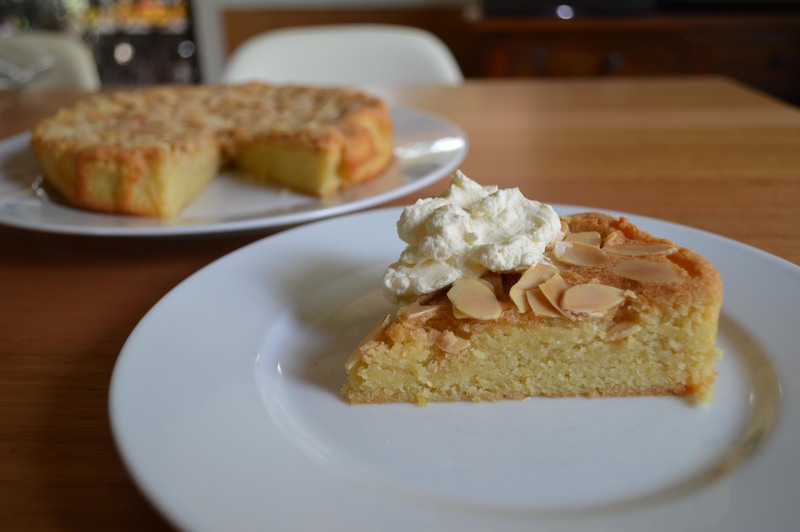 For this Sunday baking I made a Swedish Almond Cake and a Cinnamon Sugar Apple Cake. I found both these recipes on Pinterest. I have pinned them to my baked goods board. I am always adding to my Pinterest boards so if you want to check out what I have pinned for the day, you can follow me on pinterest. I have also joined in with #sundaybakingsunday on Instagram. If you would like to join in, just tag your photos with #sundaybakingsunday. I would love to see what everyone is baking. If you would like to see what I bake for sunday baking sunday, , you can see me @withvintageandme.